Wall-mounted wardrobe in hand-blown glass with brushed stainless steel wall bracket. Supplied without coat hook, please order separately if required! 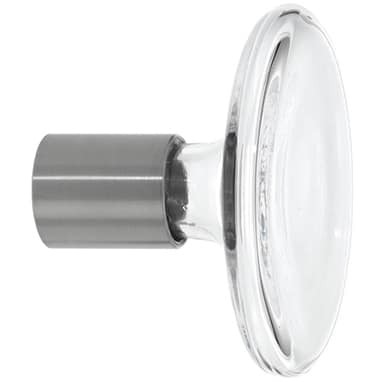 Transparency is on trend – and these blown glass BULB wall hooks prove it. Their delicate inclusions and inconsistencies are a hallmark of the art of glassblowing and make each one unique. Combined with wall fixtures made from brushed stainless steel, they have the stability they need and a spacer rod to ensure sufficient space for coat hangers. Alternatively, items can be hung straight onto BULB, or on the optional small, brushed stainless steel coat hooks. BULB’s blown glass makes for a fascinating play of light on the wall. Functional as well as decorative, BULB is available in various sizes and combinations. Do you have a question about "Bulb"? How can we contact you?